In the modern cash-rich Premier League, the most basic of maths dictates that all of the top flight’s big six cannot simultaneously enjoy successful seasons. Chelsea, Tottenham, Arsenal, Manchester United, Manchester City and Liverpool all look to progress every season and please their fanbase but the simple reality is this. There are six teams in pursuit of four Champions League qualification spots and it is Europe’s elite competition, along with the FA Cup, the Premier League and the EFL Cup that traditionally make up the four trophies available to them. That means that, every season, two sides face the prospect of missing out on lucrative qualification for the Champions League and at least two will have to deal with a trophyless season. The dominance of City this season means it will be more this time around. This means that, paradoxically, as spending has increased and therefore the level of success demanded by fans has as well, the threshold for what qualifies as a good season has actually become lower. This is where we come to Arsene Wenger. The Frenchman used to be crucified for ensuring his sides finish in the top four every season – which they managed to do until coming fifth last time around – and he has won three of the last four FA Cups. Top four and a trophy was derided as an acceptance of mediocrity but now it represents a good season for many of the Premier League’s top sides. Man United would take it this season, as would Liverpool and Spurs. Chelsea can only, realistically, get the trophy – the FA Cup, while Arsenal have the opportunity to, effectively, clinch both in one swoop – by winning the Europa League. 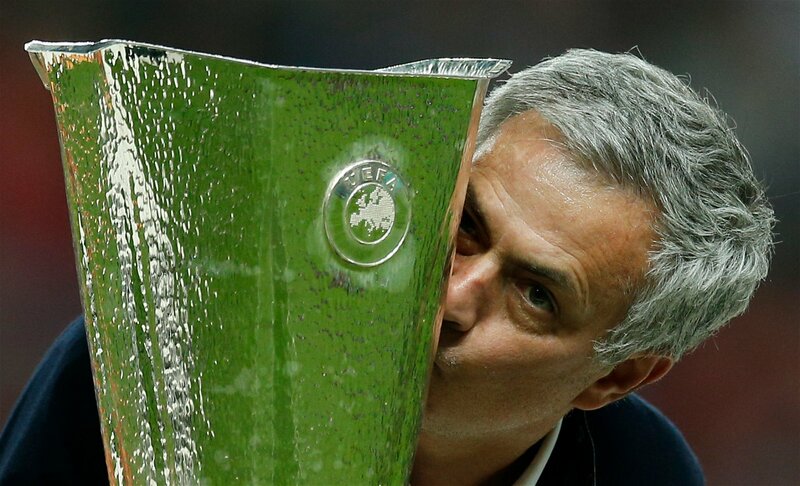 Even Jose Mourinho, who branded Wenger a “specialist in failure” made full use of Europe’s secondary competition to bolster his and United’s European record and return to the top table last season and Wenger could well do the same this time around. If English sides win the Europa League for two seasons running, it could genuinely turn into a period of sustained dominance from these shores. The aforementioned six elite sides are being forced to look elsewhere for a route into the Champions League and for silverware and the Europa League – so often derided in this country – provides both. 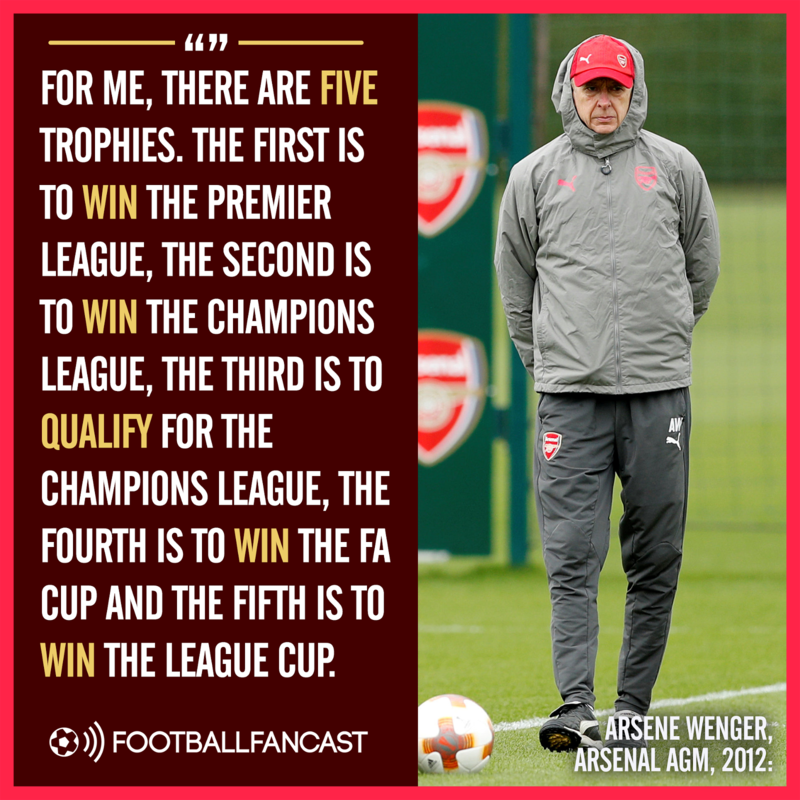 Wenger placed the fourth-place trophy in third on his list and there is a genuine argument to be made that it is that important for the side or sides who miss out on the top four the previous season. The Frenchman has come under unprecedented scrutiny this season but he could well end the campaign by delivering what he has come to value above all else – Champions League qualification – alongside silverware, which is what the fans demand. The race to the top four has always felt like a phoney war, engineered to sustain mild entertainment in the absence of a genuine title fight since 2012. Finishing in the top four is a relief but celebrating it still feels wrong and always will, no matter how financially important the Champions League becomes. Qualification via the Europa League provides the excitement of a cup run, the opportunity for fans to travel to follow each passing stage, where belief and anxiety grow in equal measure. Of course, the very presence of any of the top six in the competition is a manifestation of a previous failing but it also presents a huge opportunity to rectify that shortcoming in emphatic fashion. Wenger is so often accused of being left behind by the modern football landscape but on this one, he was six years ahead of the curve. The current state of affairs renders the Europa League his mythical fifth trophy.